Well, we are at 5 weeks and my pledge to blog more has been left behind. However I have been taking pictures and even posting them, so by checking our flickr site you will always find the updated pictures even if I haven't blogged them. Charlotte continues to be a wonderful baby. She was 11lbs 2.5oz and 22" at her one month appointment, so she's following in her big sisters' (chubby) footsteps. She's sleeping, eating and pooping well, which is all we can ask for. 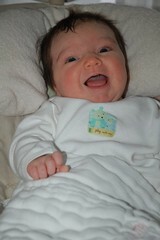 She's largely a very content baby and handles the constant coming and going pretty well. She continues to have her luscious dark hair and whether or not she keeps this head of hair in the short term, I'm thinking she'll be my dark headed beauty in the long term. Her lashes and eyebrows are both darker than Anne Marie's or Ellie's. So I may end up with my blonde, light brown, and dark brown tressed babies. We are doing pretty well. 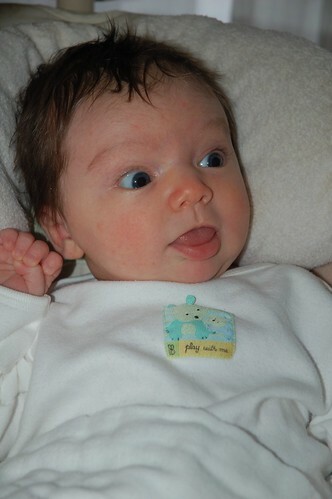 Andy and I are adjusting to having three - the youngest of which is out of her blissed-out newborn state. Ellie and Anne Marie LOVE Charlotte and are usually very helpful and gentle with her. Ellie is doing OK as she adjusts to her big sister status. She's great with the baby but we've had a little trouble with her sleep during this time of change in our family. I'm continuing my monthly photo shoot tradition with Charlotte and you can see her debut here. We've also had our second trip to Kingsport since C's birth and got to spend some time at Emory which was so lovely. We continue to be very busy and I'm still trying to do way too much - but we are enjoying our time with this blessed little baby and knowing that it will go far too fast. She will be running around here in no time (especially given our babies' penchant for walking early) and trying to keep up with her big sisters. Right now I'll try to enjoy the smiles I can coax and the lovely lump who just wants to sleep in my arms!